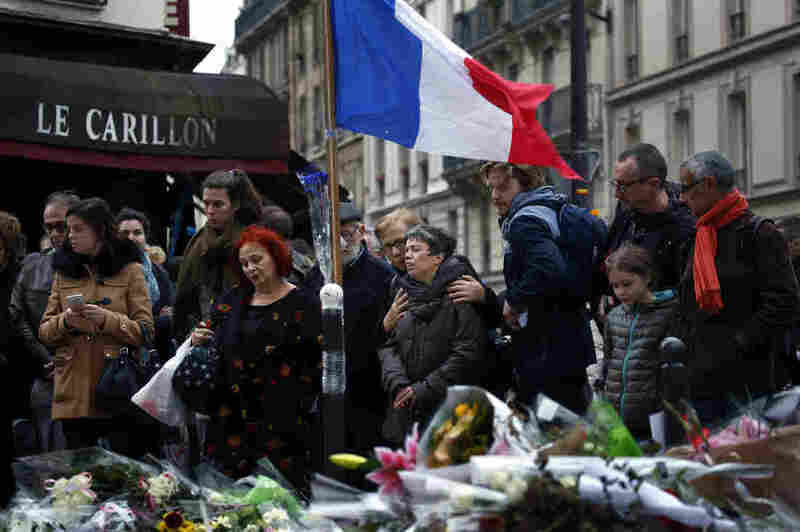 Amid Mourning, Life In Paris Goes On : Parallels NPR's Robert Siegel hears from Parisians in the aftermath of Friday's attack. A Moroccan-born baker kept his shop open even after bullets hit: "Bread, even during wartime, must always be made." People gather outside Le Carillon, a bistro in Paris' 10th arrondissement that was attacked on Friday. Over the weekend, I watched as crowds in the hundreds gathered in Paris' 10th arrondissement at the killing sites: a few neighborhood bistros like Le Carillon, and a Cambodian restaurant, Le Petit Cambodge — Little Cambodia. The crowds moved quietly, like museumgoers, as they observed the memorial bouquets and candles or added to them with a hushed reverence. There are bullet holes in the windows and walls, and the scenes of disorder inside were evidence of the chaos Friday night: beer glasses, still full, on the bar. A single shoe on the floor. Shards of glass. One American resident of this neighborhood calls this Paris' Brooklyn: a gentrified, former working-class quarter, still affordable, racially diverse — with people from North Africa, eastern Europe, even the U.S. It's full of young couples, some pushing strollers. On a Friday night, the tables would be full inside the eateries, and on the sidewalks outside them, too. Diners on the pavement outside one restaurant would face those at another. The brutal logic behind attacking these places with automatic weapons fire is evident: the sheer number of potential victims, arrayed like sitting targets, for a gunman in the street. On the wall of Le Petit Cambodge now, there are white circles of chalk, put there by police. At the center of each is a bullet hole. I count seven, all up and down the wall. And on the ground, sawdust — it may have been thrown here to absorb some of the blood. The victims of Friday night's mass murder fit no pattern, other than that they were in Paris. Perrine Karst brought her 3-year-old son to the spot in front of the Cambodian restaurant to join her in lighting a candle. "We didn't tell him any details," she says. "We just came here with a candle. We told him it was life. I just told him — I don't know anyway what I could tell him." Another Parisian who came to pay her respects, Benedicte Joffre, says it has been tough trying to explain this to her children. "What was attacked — and we talked about this a lot with the kids — is our entire society, beyond the freedom of the press," she says. "It's the idea of democracy, the idea that you can go out at night, that women can be at cafés, that women can express themselves, that men can go where they please, and the fact that you should respect what your neighbor thinks. It's just a very real attack against our society and our way of seeing things." Another Parisian who came to see the killing sites is Tariq Jabloun, a restaurant worker who emigrated from Tunisia eight years ago. He says he has often stopped at Le Carillon for coffee. He could have been a victim — a target, he says, because of the nature of this neighborhood. "The owner of this bar is Algerian," he says. "So these fanatics don't differentiate between French or Muslim. They attack everyone. They're attacking a symbol of France, the symbol of social diversity, harmony in living together, different communities and religions. And this neighborhood is a symbol of that." As for how some French-born Muslims could become attracted to such fanaticism, Jabloun can't say. We should search for the reason, he says. 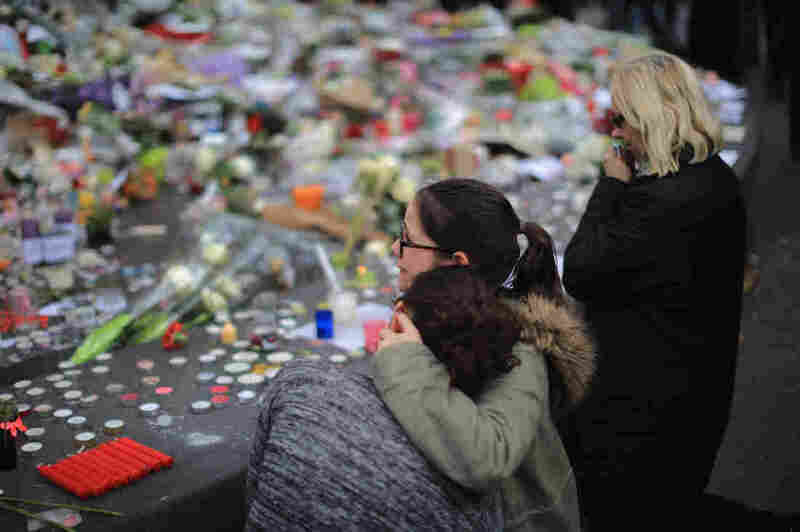 People weep as they gather Monday at the Place de la Republique to observe a minute of silence in memory of the victims of the Paris terror attacks. But Sahid Eder, another visitor to the crime scenes, says it really isn't about France. "This is an ideological war," he says. "It's simple." Eder is an immigrant from Algeria who says he opposed the Islamists there back in the early 1990s. "We could be born in the U.S., we could be born in France, ideology doesn't have borders, sir, I'm sorry," he says. "Ideology has no borders. This is an ideological war." He says everyone must confront the arguments of radical jihadists when they hear them. If people fear for the spirit of Paris these days, and doubt that it can survive last Friday's assault, Moroccan-born Mezian Ahmed is Article 1 in evidence to the contrary. He owns the Boulangerie Lina, across the street from a bistro that was targeted. So, just after this night of unspeakable terror, Mezian Ahmed went back to work. The bakery has stayed open, bullet holes and all. In Paris, life goes on.